Is A. Dale (“Bud”) Mayo the savviest man in US exhibition? One thing is for sure, after Carmike’s acquisition of Digiplex he is one of the country’s richest cinema entrepreneurs, with a hat-trick of deals in the last 15 years. So what lies behind this merger and what were the true reasons for it? The deal itself is relatively straightforward: Carmike Cinemas is acquiring Digital Cinema Destinations Corp. (“Digiplex”) in an all-shares deal that will see each of Digiplex’s 7.93 million shares exchanged for 0.1775 shares of Carmike common stock. The deal is valued at around USD $64 million, of which USD $45 million is in stock and USD $19 million in assumed debt and obligations. Mayo has thrown his 39.5% voting stock behind the deal and the FCC and other regulatory bodies are unlikely to raise any objections or even require any screen sell-off. Digiplex currently operates 206 screens across 21 locations and is in the process of acquiring another 5 theatres with 53 screens, for a total of 26 cinemas with 259 screens. Once the deal goes through Carmike will have grown to 280 cinemas with 2,936 screens across 41 US states. Significantly Digiplex brings four new states to the Carmike fold where previously it had no presence: Arizona, Connecticut, Maryland and New Hampshire. There is a two-fold reason for Carmike to do this deal. Inorganic growth (i.e. mergers and acquisitions) was the only way that Carmike could achieve the goal announced by its head last year. Carmike has already acquired Muvico Entertainment with its nine cinemas with 147 screens in Florida, California and Illinois for around USD $31.8 million late last year. Prior to this it purchased 16 multiplexes from Rave Review Cinemas (including seven IMAX screens) and three multiplexes from Cinemark (one Imax theater) for a total of eight Imax screens. 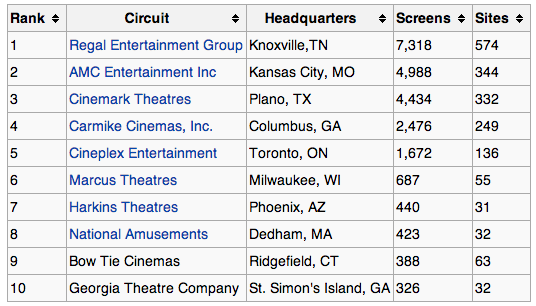 There was also two theaters with a total of 16 screens in Kentucky and Tennessee bought from Phoenix Big Cinemas in 2012. So the deal to buy Digiplex is only the latest but largest in a series of acquisitions that total 30 multiplexes even prior to Digiplex in the last couple of years. While there is consolidation in the cinema industry both in the US and beyond, there is thus a clear roadmap that Carmike is following. But these numbers, either multiplexes, screens, dollars or shares don’t tell the full story for Carmike – whereas a single digit does: 4. Carmike likes to describe itself as “one of the nation’s largest motion picture exhibitors” and as “America’s Hometown Theatre Chain” but no matter which way you look at it, the chain is only the fourth largest circuit and a lonely fourth at that. Why ‘lonely’? Consider who the top three circuits are, as well as who is fifth. The chart below from Wikipedia is out of date, but it gives you a fair idea of the situation. The top three Regal, AMC and Cinemark are the Big Boys and they have their own club, while below Carmike is Canadian exhibitor Cineplex. Position six and lower are occupied by cinema chains whose screen numbers are only in the three digits and sites in two digits. (Keep in mind this does not include Mexico’s Cinepolis). It would be wrong to attribute a corporate inferiority complex to Carmike, but the exhibitor is effectively all too often on its own. It is worth remembering that Regal may be the largest chain and AMC has Chinese backing, but the reason Carmike is not in the same league as Cinemark is because Regal, AMC and Cinemark were the co-founders of cinema advertiser National CineMedia (NCM) and by extension also Fathom Events. Carmike meanwhile was the largest client of Screenvision and held a 19% stake. With NCM buying Screenvision (subject to regulatory approval) it means that Carmike will get a good sum for its stake, but will now have to rely on NCM for its advertising, without having a direct stake in the company – unlike its three bigger rivals. The same is true for Fathom Events, which will probably assume most of the functions of Screenvision’s alternative content operation in some capacity. Carmike will have received assurances about becoming part of NCM and Fathom’s network, or it would not have voted for the NCM-Screenvision merger, but that does not mean that it does not feel somewhat exposed. Significantly Digiplex has a 50% stake in the DigiNext independent distribution platform, with the other half owned by Nehst Out. It is thus competing with other exhibition-distribution ventures like Magnolia Pictures (Landmark Theatres), Drafthouse Films (Alamo Drafthouse cinemas) as well as Cinedigm (born out of May’s former company AccessIT). DigiNext could even conceivably take on alternative content, though the field is getting crowded, if Fathom Events has to divest itself of some of Screenvision’s non-compete agreements. So it is clear why Carmike bought Digiplex, but the more relevant question is why was Digiplex sold to Carmike and is the deal all that it seems. Digiplex was built to be sold from Day 1. Mayo has made a career of creating and selling cinema businesses. In 1998 he sold Clearview Cinemas to Cablevision (later acquired by Bow Tie Cinemas). With the money he got he set up AccessIT, which went on to become the largest third-party digital cinema integrator in North America, before Mayo “retired” and stepped away in 2010 from the business, which by then had changed its name to Cinedigm and was changing focus to film and television rights. But the retirement only lasted seven months before he founded Digital Cinema Destination Corps., aka Digiplex. Mayo thus took his exhibition learnings from Clearview and digital lessons from AccessIT and combined them into Digiplex. The biggest learning was to sell at the right time and to the right entity. Clearview Cinemas was at best a distraction for Cablevision, which is why it sold it 15 years after buying it, but it was bought at a time of ‘vertical integration’ mania that also saw AOL and Time Warner merge (remember that one?). However, it was a canny sell for Mayo. Similarly he got out of AccessIT/Cinedigm when its raison d’etre was crumbling – digital cinema conversion was underway, but 3D was driving it and the biggest circuits (Regal, AMC and Cinemark) were doing it themselves – which is why Cinedigm switched to distribution. So Mayo was not going to keep expanding Digiplex forever any more than he was going to watch Godzilla three times in a row at one of his cinemas; he’s seen this show before and he knows how it ends. What took the industry by surprise is how quickly he turned it around. But anyone who knew him from Clearview days shouldn’t have been surprised: he founded Clearview in 1994 and similarly sold it four years later. He was particularly clever in his choice of locations (DMAs – designated market areas) and could not have positioned it better for Carmike to take it over than if had he gift wrapped and put a big bow on it. Where Mayo excelled was in talking up the potential of alternative content and new revenue streams. Watch him in this interview to see a master at work. Or take note of the social media platforms listed at the end of the Digiplex corporate boilerplate. Digital Cinema Destinations Corp. (nasdaqcm:DCIN) is Digiplex Destinations, a fast-growing theatrical exhibitor dedicated to transforming its movie theaters into interactive digital entertainment centers featuring ‘something for everyone.’ The Company provides consumers with uniquely satisfying experiences combining state-of-the-art technology with engaging, dynamic content that far transcends traditional cinematic fare. Digiplex customers enjoy live opera, ballet, Broadway shows, sports events, concerts and, on an ongoing basis, the very best major motion pictures. You can connect with Digiplex via Facebook , Twitter , YouTube and Blogger . Bud sees your money. Bud takes your money. Run from Bud. Which is droll, but crucially Bud did not get a single penny from Carmike. He got shares. This is key to understanding the fundamentals of the deal. Here is something that might at first strike you strange – why didn’t Carmike just buy Digiplex? The deal was effectively a share-swap absorption of a smaller exhibitor by a larger competitor. But shares swaps are not the preferred method of doing acquisitions and if you look at Carmike’s previous deals you will see that they paid cash for their four most recent deals. Was this one a swap because Digiplex was already listed at Nasdaq? Nope. Less than three weeks ago, Carmike had already made the headlines due to another insider purchase: Daniel Ellis, a Special VP and General Counsel at Carmike, had acquired 86 shares of common stock at $21.85 per share, following the clearance for the construction of a massive Carmike Cinemas movie theater in East Montgomery, AL. Back to Passman, I should highlight that this is not an isolated purchase, but rather part of a wider strategy. 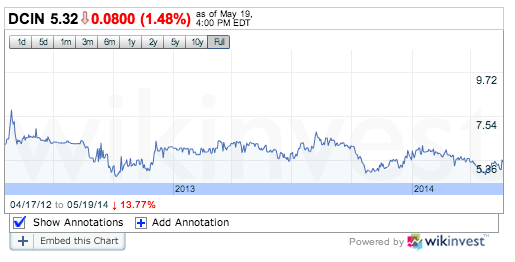 Both Passman and Ellis have been buying the company’s stock every month for, at least, the last two years. Over this period, the stock has almost quadrupled in price. This is not a suggestion of financial impropriety but rather that the senior management believe in the Carmike’s future direction, so they are buying into it. So Carmike shares have almost quadrupled in value while Digiplex shares have lost a quarter of their value in approximately the same time frame. So Mayo is clever, but that does not mean that Passman et al at are fools and Carmike were well advised by Macquarie Capital (financial advisors) and King & Spalding LLP (legal counsel) in this deal. Effectively Carmike is letting Mayo and the other Digiplex shareholders catch a ride on the rising Carmike shares, most likely with a lock-in period which means that they cannot divest themselves of the shares immediately. Digiplex’s shares were at best treading water and Mayo knew this. Always talk about where the share peaked, not where they went after that. Mayo has once again proven himself a master of a good deal and will no doubt pour some of the proceeds into the New Jersey-based non-profit Mayo Performing Arts Centre. So he is giving back to the community. Hopefully this means Digiplex goes away for good. I’ve never seen such incompetent people in charge of a major company. Absolutely no respect for their employees or customers. Good riddance. On the contrary, Not a Fan, Bud Mayo is incredibly competent at spotting a market opportunity, mastering a rollup and getting out at the right time. As he has just proven for the third time. And I would even bet that he is not ready to retire just yet.